These Quinoa Patties with Zucchini and Feta Cheese make the perfect meatless meal that is full of healthy goodness! Combine quinoa with 1.5 cups water in a medium saucepan. Bring to a boil. Cover, reduce heat to low and simmer until quinoa is tender (about 15 minutes). Using a paper towel, dredge the liquid out of shredded zucchini. In a big bowl, combine cooked quinoa, zucchini, cheese, garlic, dill, sun-dried tomatoes, eggs, bread crumbs, salt and pepper. Mix well. Form the mixture into small patties. If they start to fall apart, add more breadcrumbs one tablespoon at a time. Heat the oil in a large skillet over medium-low heat. Working in batches, cook the patties for 5 minutes on each side. Transfer to a plate and let them cool. To make a simple sauce, combine all ingredients and serve! 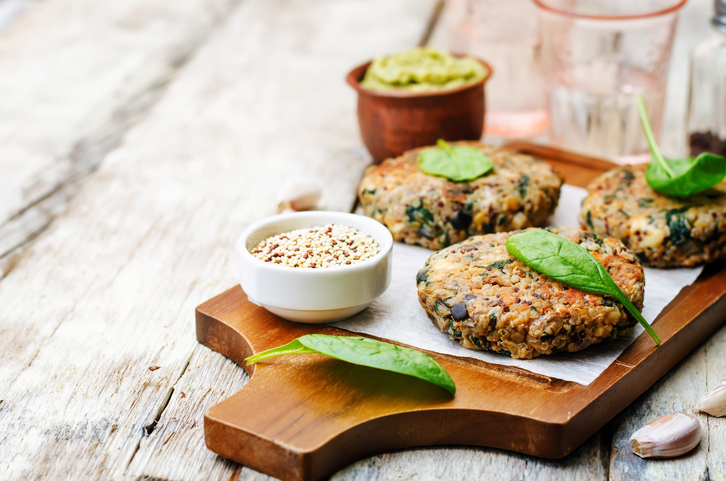 The post Quinoa Patties With Zucchini And Feta Cheese appeared first on Lucky Blog - The LuckyVitamin.com Health & Wellness Blog.